If you have read my previous post for this pair of Mute Swan, you must know that I have been following this two swans for few years. They spend most of their time at this pond and from time to time, they might go somewhere else to have some fun or visit their friends. Sadly, I have never seen their offspring In April, I was talking to a good friend with a picture I recently photographed "a happy Canada Goose family", he asked me if I have visited swans lately. So my assignment is to snap swans. 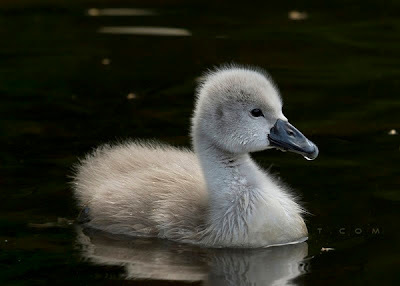 Stopping by the swan lake last Friday, I saw few mallards and chicks but I did not see my two swans. I just waited there, set up my camera and enjoyed this warm spring afternoon. Before I got bored, one swan swam towards me .... and guess what? Three tiny cygnets were behind their mum! I was definitely sure that she was the mum because their dad was chasing mallards all over the lake. They must think I have food for them. And believe it or not, I did! I know I'm not supposed to feed wildlife, but to me, they are like my family. I could not recall how many times I have visited this lake and just watching these two swans swimming around this spring fed lake made me feel relaxed and free.